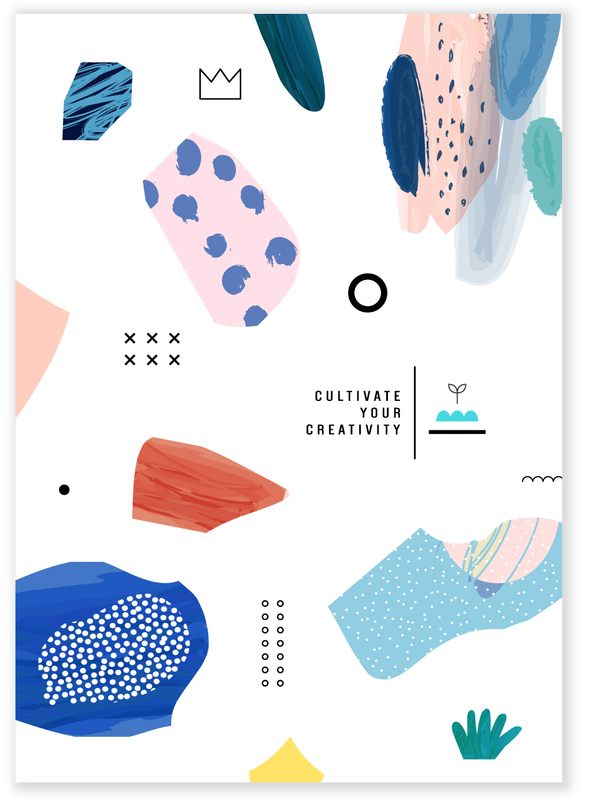 See how Abstract Geometry has evolved from fine art to creative trend, and how you can use it to charge your designs with fresh style. Abstract geometry, with its seemingly random placement of shapes, has become prominent in modern graphic design. It might seem like a sudden trend, but it has roots in early modern art and even pre-historic art. When Wassily Kandinsky began to create what we know as abstract art, he and those who followed were deconstructing the principles that guided institutionally recognized art to that point. They reduced their art to expressions of forms, colors, lines, and shapes, not unlike the earliest recognized art by humans yet discovered. Others, like the Cubists, Bauhaus, and Memphis Group, went on to evolve the use of geometry and grids, planting the seeds for modern graphic design styles. We can transpose this strategy onto graphic design. While trends evolve, especially in the ever-changing world of contemporary design, simply copying the past will only get you to a dead end. Successful trends based on the past have found new ways to use old language. Let’s look at how abstract geometry is reimagining the past and how you can use it in your own designs. Abstract Geometry is finding its way into design for festival posters, web design, magazine covers, and anywhere else accepting of its expressive and modern look. This example shows an informed Memphis Group style, but with new attributes like bold colors, gradients, and more geometric shapes applied. It looks positively electric compared to the more ’80s and ’90s-inspired retro style below, yet both employ hyper-modern techniques. In these examples, we see a split in the treatment of shapes. One way is to use hard geometric shapes. Another way is to use more organic, hand-drawn shapes. Typography is also treated by breaking it apart, spacing letters in unnatural ways. This can be an interesting way to set headlines, but always watch out for readability! Both examples show abstract forms, but you see how the differing approaches to shapes can totally transform the visual language. Notice how the colors of both designs skews toward muted, or organic, mixed with bold. This gives an organic feel to organic shapes or softens the harder geometry for a retro vibe. Another route is to use several modern styles in one piece and make the abstract geometry the glue that ties it all together. Here we see a bright, vibrant gradient intersected with organic flat shapes in contrasting colors and gradients. Go nuts. This style approves of nearly all your ideas for experimentation. Styles can blend. This image blends the Punchy Pastels trend with geometry and modernism, creating a very current look, while avoiding style confusion. Achieve this by applying abstract elements to realistic photography or illustration. Play with dimensions, flat vs. realistic, to make the subjects jump out and take the spotlight. Then apply some bold colors for vibrance, and a muted base to ground it all. It’s actually a child’s foam puzzle of a duck. Creating a deeper meaning like this puzzle encourages engagement with your customer or viewer. It takes thought and planning, and a general sense of whimsy, but we see it in plenty of classic and enduring work to make it a worthwhile pursuit. The main idea is to use abstraction when it can support a message or a subject. Style without substance is just that. Stay educated and curious, and apply thought to your approach and style. What Is Millennial Pink and Why Won’t It Go Away? Aaron is a 15 year graphic design veteran and lives in Denton, TX. He likes road trips, cameras, and complex concepts in design a whole lot.